Empty drums in the yard are a problem because they take up so much space and are difficult to store and dangerous to stack. Organisations which have 45 gallon drums to recycle will be interested in the JMC 45 gallon Drum Crusher. 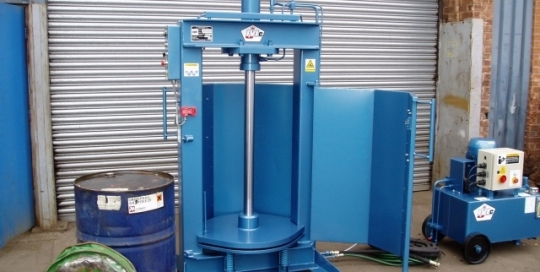 This robust and reliable machine will reduce heavy duty drums up to the 45 gallon (205 litre) in size to discs which are about 4″ (100mm) thick at a rate of of up to 100 drums an hour.